Bear Fever, a collaborative public art project, was inspired by a desire to celebrate and beautify a beloved hometown and community. Bear Fever's mission has been to create greater community cohesiveness across generations, professions, and interests by bringing many members of the community together to have fun and work hard. Plus, Bear Fever has endeavored to promote the arts and artists everywhere, but the project has been especially eager to celebrate those many gifted artists of all ages who live and work in the greater Boyertown community, a very special kind of place. In addition, another distinctive feature of Boyertown's Bear Fever's mission--enlisting the involvement of the community's young people in each aspect of the project--has given them experiences and authentic opportunities to participate in their community, employ their knowledge, and practice communication, art-related, and business skills that they learn in their classrooms. The students developed friendships among all age groups, learned about their community's wealth of resources and the support for them and their education, discovered career paths, and made a remarkable difference in their community. Download the Bear Fever Poster! shared to mount life-sized bear sculptures—the community's mascot—on the streets of Boyertown, PA. The Stahls were inspired by similar sculptures of donkeys and elephants in Washington, D.C. and the original Cow Parade staged in Chicago in 2000. The project secured initial funding through the assistance from a grant awarded to Boyertown Area School District designed to support projects in which students and community worked together. 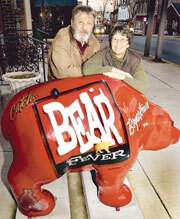 By May 2005, over 30 Bear Fever bears debuted at the annual Boyertown Area Senior High School's Arts Expo. The bears were sponsored by assorted businesses, organizations, and individuals and created by assorted artists—professional artists, volunteers, and students in grades Kindergarten-college. Students worked with professional artists, business owners and their staffs, community members, and school personnel in a variety of efforts: promoting the project, developing additional community activities and business ventures related to its mission, marketing, fundraising, grant-writing, and publicizing the project in a variety of media. Affordable Tabletop Bears Available from Sculptor Martha Cawley and the Bear Fever Audio Tour CD's Available Click here for more info! Check out our bear gallery for updated pictures! Copyright 2004 © Bear Fever | About | Map | News | Contact | Gallery | Sponsors | Artists | Involved | Adopt | Links | Designed by Media Fusion Technologies, Inc.